This is a basic question, but the Nintendo 3DS system doesn’t just play Game Cards that are made especially for it, right? Right. It’s compatible with software for previous Nintendo DS systems. 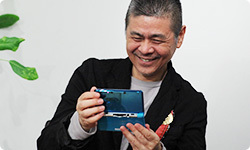 New Game Cards, however, will be specific to the Nintendo 3DS, but whether they will be in 3D or not is basically up to the maker, just like how much to use the Touch Screen was up to developers for the Nintendo DS system. 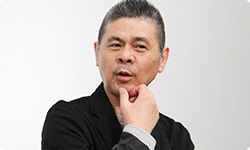 Suddenly requesting all game developers to only make 3D games on Game Cards exclusive to Nintendo 3DS from now on would really raise the hurdle for them. We thought it would be better for developers, as well as players, if they could do as they please depending on the software. If you think about that, the 3D depth slider, which allows you to adjust the intensity of the 3D effect, is an important discovery. The idea of the 3D depth slider solves several problems posed by 3D. As soon as that idea came up, a programmer made a prototype of it in a form similar to regular sound volume control. It was good, so we included it in the product. It really made sense when I tried it. Like Miyamoto-san said, inputting numbers wouldn’t have worked. It has to be like a volume slider. I can really understand that. When you adjust the settings on a digital camera to take a picture in a particular way, you usually have to do it with numbers. That isn’t very helpful. I know what you mean. When zooming, for example, it’s easier to get what you want by grabbing the zoom lens and turning it than it is by pressing a switch and having it zip in or out. Other than analogue input accompanied by immediate analogue results, you can’t adjust anything very precisely. Even if there’s a function that allows you to make adjustments on a certain screen, there isn’t much point. Right. You have to make it in the right form. The Nintendo 3DS has two cameras lined up for taking 3D pictures. We thought it would be good to have those, as well. I suppose that ups the cost. Yes. By more than just the cost of the parts for two cameras. Well, the Nintendo 3DS cameras are small, and don’t possess particularly amazing resolution compared with a regular digital camera, so some might not think it would cost much to put in one more, but there’s a big difference between one camera and two. That’s because, in order to take a proper 3D photo, the optical axes for both have to be perfectly aligned and facing the same way. The precision necessary when compared to having just one camera is completely different. If the angles and axes of the two cameras aren’t in line with each other, they aren’t of any use as cameras for taking 3D photos. People in charge of manufacturing must have thought that this would be the biggest challenge for them for the mass production. If the axis is off a bit for just one camera, you just take a photo in line with that. Did anyone question whether a 3D camera was really necessary? Well, I say that because if it were up to me I would probably not go for it. You see, as an owner of a small business, I tend to think like “I know that it’s fun, but do we really want to include thinking about the costs and troubles?” I’m in no way saying that 3D photos aren’t appealing. Do you think the appeal isn’t worth the costs and troubles? Let’s see. It’s just that if someone was to pressure me to make a decision, I may think of it in that way. Iwata-san, you didn’t worry about things like that? I didn’t. I had positive feelings about it from the beginning, and as we went further along with development I felt the reasoning as to why we made the camera 3D grew more prominent. Things like rising costs or troubles of mass production didn’t affect my decision at all. It’s simply because “people love to take 3D photos!” (laughs) Everyone’s happy when they can take 3D photos and display them. Until now even if you have taken 3D photos, you wouldn’t have many ways to show them off, but if everyone has one and is taking 3D photos and showing them to each other, then that changes the value. There are digital cameras that can take 3D photos, but if that becomes a standard feature on a game system that everybody owns, I think it will completely change the way people will play with 3D photos. Also, the appreciation is much greater when you have it as an added feature on a gaming system, I think. I see. Now that you explain it, I can see that. 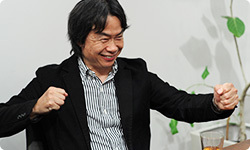 Miyamoto-san, could I have you hold out your hand a second? (showing the photo to Itoi-san) It looks like this. Over ten years ago, when I went on a company trip, someone prepared a camera that could take panoramic photos. We had them specially printed and handed them out to everyone. A surprising number of people still have those. (laughs) And people hold on to the photos they take when they visit events like dinosaur exhibits with their children. Perhaps this is going to be the first time when something like this can spread far and wide rather rapidly. Yes. So just as photography changed its meaning when mobile phones and cameras came together, it will be interesting to see what happens when a lot of devices with 3D camera functionality spread around the world. The more I hear about it, the more I’m glad it has a 3D camera. I think it will be fun if we’re able to include video recording capabilities with future updates. I have no idea, but when you take 3D photos and videos, is there some kind of capacity limit? An SD Card goes in this slot. Oh, an SD Card! Like two gigabytes? It comes with a 2-gigabyte card, but you can, for example, use a 32-gigabyte one as well. Oh, okay, I see. So you seriously can take as many as you want. Yes. Long videos, lots of photos, they’ll fit. So it’s all right to take it with you on a trip and take lots of 3D photos. Yes. I think 3D photos recording travel experiences would be quite pleasing. And if you take photos of food in 3D, it looks extra delicious! I suppose so. You could use it at work, too. I would think that 3D records would come in handy at construction sites, for example. Yeah. Wow. If I think about it, Nintendo has always done a lot with cameras. Like releasing a Game Boy Camera and Game Boy Printer20 for Game Boy Pocket.21 20Game Boy Camera and Game Boy Printer were accessories released for the Game Boy system in 1998. 21Game Boy Pocket: A handheld game console released on July 21, 1996 in Japan (and in Europe in 1997). It was a smaller, lighter version of the Game Boy system. Back then, no one else had thought of turning cameras into toys. Yeah, I think these cameras should be there! How do I put it, whether it’s the 3D photos or the 3D depth slider you may be able to say the same thing, but there is a huge difference between simply reading “it jumps out at you” on a spec sheet as opposed to actually playing with something that you see jumping out at you. You feel a lot happier. Right. As the owner of a small business, I totally get it. Folks, these cameras should be there!